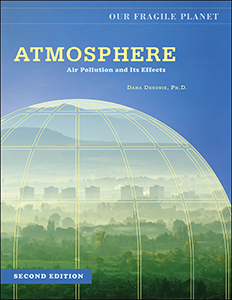 Authored by: Dana Desonie, Ph.D.
Earth's atmosphere supports and protects all of its life, giving the planet its blue skies, mild temperatures, and weather. But people use the atmosphere for another purpose: as a dump for waste gases and particles. Air pollution obscures vistas, damages ecosystems, and compromises human health. Combined with water in the atmosphere, air pollutants create acid rain. In the upper atmosphere, air pollutants damage the ozone layer, which protects life from the sun's harmful rays. Excess emissions of greenhouse gases like carbon dioxide and methane push global temperatures higher, creating global warming. While some pollutants are successfully regulated, as the population grows and industries expand, more intensive solutions are needed to deal with the many types of air pollution and its consequences. This provocative eBook tackles these issues in a straightforward manner and shows readers what they can do to help conserve our planet's atmosphere. Dana Desonie, Ph.D., has written about the earth, ocean, space, life, and environmental sciences for more than a decade. Her work has appeared in educational lessons, textbooks, and magazines, and on radio and the web.